For other uses, see Cherwell (disambiguation). 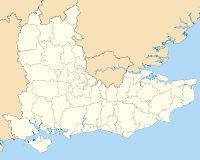 Cherwell (/ˈtʃɑːrwɛl/ CHAR-wel) is a local government district in northern Oxfordshire, England. The district takes its name from the River Cherwell, which drains south through the region to flow into the River Thames at Oxford. The Northern half of the Cherwell district consists mainly of soft rolling hills going down towards the River Cherwell, however the southern half of the district around Bicester is much flatter. Much of the district is soft rolling hills with the northwest of the district lying at the northern extremity of the Cotswolds. Cherwell district has one of the country's highest recycling rates at over 40% (2005). The district used to have a recycling rate of just 9%. This changed with the introduction of the blue box scheme for recycling paper, which has since grown to include plastic, cardboard and cans. Kidlington has its own freecycling group. Cherwell District came top of a Which? study that ranked 395 local authorities in Britain on their record of enforcement of food safety regulations. On a Wreath Or and Vert in front of a Rainbow proper an Oak Tree eradicated Sable leaved Vert and fructed Or, Mantled Vert and Azure lined Or and Argent. Vert a Pale wavy Or thereon a Pale wavy Azure all between two Pallets Argent on each a Pallet Azure. ^ BBC Oxford How do you pronounce Cherwell? ^ Ann Spokes Symonds; Nigel Morgan (2010). The Origins of Oxford Street Names. p. 36. ISBN 978-1-899536-99-3. ^ How does your council score on enforcing food safety?